On the road between Syracuse and Rochester, were a number of sympathetic Quakers and other abolitionists settled at Auburn. Here also was the home of US Senator and former New York State Governor William H. Seward (and known for Seward's folly). Sometime in the mid-1850s, Tubman met Seward and his wife Frances. Mrs. Seward provided a home for Tubman's favorite niece, Margaret, after Tubman helped her to escape from Maryland. In 1857, the Sewards provided a home for Tubman, to which she relocated her parents from St. Catherines. This home was later sold to her for a small sum, and became her base of operations when she was not on the road aiding fugitives from slavery, and speaking in support of the cause. The spring of 1857 was the time when Harriet set out on her most daring rescue to free her elderly father, Ben Ross. Tubman bought a train ticket for herself and traveled in broad daylight which was dangerous considering the bounty for her head. When she reached Caroline County, she bought a horse and some miscellaneous parts to make a buggy. She took this and her father and mother to Thomas Garrett who arranged for their passage to Canada. In early 1859, abolitionist US Senator William H. Seward sold Tubman a small piece of land on the outskirts of Auburn, New York for US$1,200. The city was a hotbed of antislavery activism, and Tubman seized the opportunity to deliver her parents from the harsh Canadian winters. Returning to the US meant that escaped slaves were at risk of being returned to the south under the Fugitive Slave Law, and Tubman's siblings expressed reservations. Catherine Clinton suggests that anger over the 1857 Dred Scott decision may have prompted Tubman to return to the US. Her land in Auburn became a haven for Tubman's family and friends. For years, she took in relatives and boarders, offering a safe place for black Americans seeking a better life in the north. Shortly after acquiring the Auburn property, Tubman went back to Maryland and returned with her "niece", an eight-year-old light-skinned black girl named Margaret. The circumstances of this expedition remain clouded in mystery. There is great confusion about the identity of Margaret's parents, although Tubman indicated they were free blacks. The girl had left behind a twin brother and a loving home in Maryland. Years later, Margaret's daughter Alice called Tubman's actions selfish, saying: "she had taken the child from a sheltered good home to a place where there was nobody to care for her." Indeed, Alice described it as a "kidnapping". In 1863, Tubman led a group of African American Union soldiers on raids along the Comcahee River in South Carolina. There she met a soldier named Nelson Davis. They were married in Auburn in 1869, with the Sewards among the many friends in attendance. Davis and Tubman lived in a brick house on the property until his death in 1888. That house is now used as home for the Resident Manager of the Harriet Tubman Home. In 1896, Tubman purchased at auction the 25 acre parcel on which the Home stands, for $1450. At this time she was receiving a $20 monthly pension that had been awarded to her by the Congress. Unable to raise sufficient funds on her own, she deeded the property to the African Methodist Episcopal Zion Church in 1903. 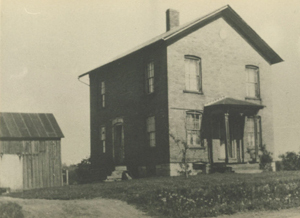 In 1908, the Harriet Tubman Home was opened, in the frame structure that still stands, and the original brick home, which has since been demolished. Throughout her remaining life, from 12 to 15 persons were housed there. After Tubman's death the home continued to operate for a few years, and was then closed. The existing frame building was vacant from 1928 until it was ordered demolished by the city in 1944.